This is a sports themed Bounce House rental. Kick off any outdoor event with this sports arena bounce house. 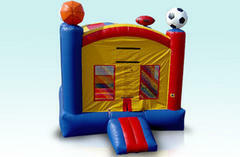 This Bounce House was designed with a football, basketball, baseball and soccerball a top of the 4 pillars. It is a unisex unit and includes a basketball hoop inside the Bounce house. This is the perfect inflatable bounce house rental for sports lovers. This is sure to be a slam dunk. also be sure to add a shade tent or check out our Combo Bounce houses. We also offer concessions.